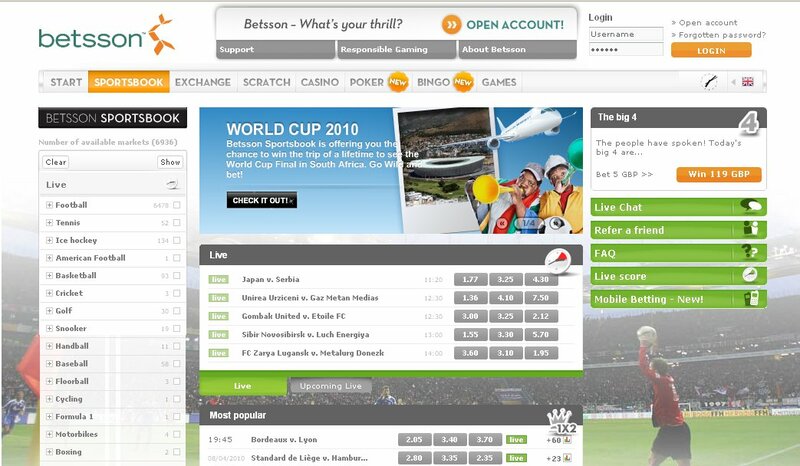 Betsson bookmaker was launched in 2000. It is operated from and licensed in Malta. This quality online sportsbookis part of the Stockholm-based Betsson Group which, as for 2010, employs about 250 people. Since 2005, the group is listed on the Stockholm Stock Exchange. In Dec. 2009, Betsson boasted more than 2 million registered customers. In 2006, Betsson company received the Best Gaming Site in Sweden award by the Internetworld magazine. In 2009, Betsson was awarded the prestigious title of the Socially Responsible Operator of the Year during the EGR Awards ceremony annualy arranged by eGaming Review. According to the eGaming Review's ranking, Betsson belongs to the Top Ten gaming sites in the world. For the past few years, this bookmaker has increased its collection with several new awards, including the title of the Best Bookmaker of the Year in 2011 and 2012, and in 2013 it received the award in the category Gaming Industry Fair Play according to The International Gaming Awards. In 2012, Casino Betsson Group was also awarded with the title of the Best Casino of the Year at the prestigious awards ceremony eGR Awards. Betsson bookmaker was founded in 2001 by Fredrik Sidfalk, Henrik Bergquist and Anders Holmgren, and in the following year it got the bookmaker license in London. Soon afterwards, Betsson added exchange betting to their website. In 2005, the Global Gambling and Gaming Group certified Betsson as a Responsible Gaming Site. Since its early beginnings, Betsson has established a strong position not only in the Nordic region, where it has most customers, but also in such countries as the Czech Republic, Turkey, Serbia and France. Betsson is also the first and only company which has oppossed Swedish state monopoly by opening a betting outlet 'Shopsson' in on Götgatan Street in Stockholm. Betsson.com is primarily a sportsbook with a good range of football leagues, cups, and international matches, and with a few typically Scandinavian disciplines infrequently found elsewhere, that is bandy, floorball, ski jumping, Nordic combination, cross country, and Alpine skiing. Apart from sports betting, one can enjoy TV Events (with bets on Norwegian or Danish X-Factor), and E-sports section (with bets on such games as World of Warcraft, or Counter Strike). Besides, the bookmaker has clearly organized exchange betting which covers several sports: primarily football (various betting options), bandy, handball, basketball, rugby, floorball, American football. The website also contains amazing scratches, casino, refurbished poker (with a very good poker academy, poker club, mobile poker and many more), bingo and games (hi/lo games, card games, lottery/keno, dice games, wheel, sports). Interestingly, Betsson's brand new scratch section, is in fact one of the biggest ranges of scratch cards among all the online gaming sites including such categories as classic scratch, sports scratch, fantasy scratch, casino scratch, or slots scratch. Betsson is the exclusive sponsor of the FCbet Tipster Competition organized by FCbet.com (an online guide for bettors with good odds comparison service). In the recent years we can observe the increased marketing activities of the Scandinavian bookmaker. In August 2011, it became the sponsor of English football club Arsenal. Under the three-year agreement Betsson will be an official partner of the club, and both parties to the contract will create a special website for the Gunners fans. Residents of the following countries and regions are not accepted at Betsson: United States of America, Hong-Kong, Malaysia. Max stake Varies between the different bets. There are limitations for how much a bettor can win on a specific bet. Max winning Depends on a specific bet.